A couple of months ago I wrote that Texas A&M must be suffering from an identity crisis. My post was only half serious as I was simply not impressed with yet another uniform change. While reviewing A&M’s new uniforms, I hinted at the fact that their newly unveiled uniforms did nothing to advance the tradition-rich culture that Texas A&M claims to be so proud of. If you can’t tell, I am more of a traditionalist and would like to see Texas A&M adopt the same mentality. However, realizing that the uniforms weren’t as ugly as they could have been, I was ready to move on and adjust to the new look. Unfortunately, moving on was going to be harder than I thought. A week later, Mississippi State unveiled its new uniforms. 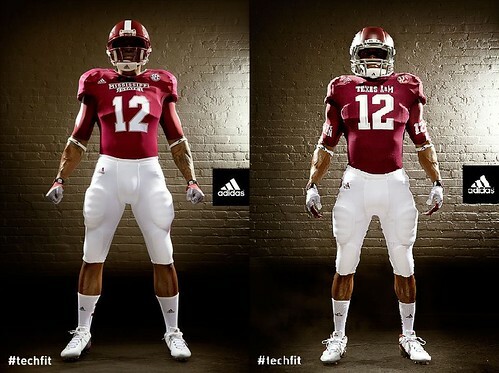 The Bulldogs new uni looked strikingly similar to that which Texas A&M had just unveiled. It was now more than abundantly clear that while A&M had a new uniform; its new uniform was generic and identical to another team’s uni from the same conference. How is that for unexciting? There are those who will point out the subtle differences between the uniforms above, trying to show how Texas A&M’s new uniform is nothing like Mississippi State’s new uniform. I will have to disagree. I can’t say for certain, but I am guessing that he was responding to the reactions and comments of those who saw the two uniforms as being too similar. I didn’t know it at the time but Stricklin’s second message/tweet was a hint at the fact that Mississippi State wouldn’t be wearing the above referenced uniform on November 3, 2012 when the Bulldogs played the Aggies. However, what was clear from his tweet was that Mississippi State would be doing something to commemorate the last meeting between the two schools — the 2000 Independence Bowl (#SnowBowl12). I would normally think that such a commemorative event was completely and totally random. However when your uniform is virtually identical to your opponents, you need a reason to wear something different. On the Texas A&M side of things, I have no clue what their plans were. For all I know the Aggies had planned on wearing a different uniform against Mississippi State from day one. After all, the Aggies were aware of the similarities between their uniforms and Mississippi State’s, so they had to at least have a “Plan B” in the back of their minds. The non-Aggie administration is trying to kill A&M’s identity due to the fact that they can’t personally relate to it. Adidas decided that Texas A&M would wear the all-black uniform so that they would have more merchandise to sell. This is a conspiracy cooked up by Miss. State alum Jason Cook, who is currently the VP for Marketing and Communications at Texas A&M University. Upon realizing that their uniforms looked just like Mississippi State’s, Offensive Coordinator Kliff Kingsbury exacted his final revenge on A&M by suggesting that they wear a uniform that closely resembled what he wore while playing at Texas Tech! The last one is my favorite. If it is not the real reason, I am going to pretend like it is. This entry was posted in 2012, Texas A&M by Travis Normand. Bookmark the permalink.